oh wow! Ive never seen a Weregarurumon cosplay before! nice! I wonder what cons Weregarurumon, Amateratsu and Wolf Link went to when they came into the picture. Those three were brilliantly well done and are high on the list for upcoming huggles from me. Now, that's a badasss Weregarurumon. Weregarurumon! I love it! Great job! Could you do another one under commission? I will pay you anything! Very well done costume! may i ask how you went about makng the muscular chest piece? That is one of the most awesome suits I've seen in a long time! he's definitely the best digimon. gah i wish i could have! Great job! Thats Amazing!!! I have a question for you.. What did you make the arm bands out of on the right arm? oh wow, that must've taken forever to make? What kind of fabric do you use for your fur? how did i never see this?! it looks fantastic! WOW that is some serious badass cosplay!! Um, I think we need to get married now. full budy suits? I start with a duct tape dummy (google it), build the muscles in foam and attach them to an undersuit, then fur over that. The ultimate big bad wolf! LOL! I Love this its Intense, seriously Awesome detail to this costume! Wish I was rich so I could buy it from you! You did a MAGNIFICENT job on it! This is amazing. very well done. But they are still one of the favs. OMFG!!!! Is the REAL Weregarurumon, or one of your ULTIMATE looking cosplays!! 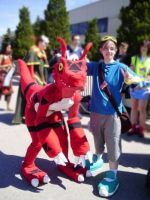 I wore this at minami, and anime con in the UK (southampton). have a go! there are lots of resources online to help you build a nice suit, it's fun and so much more satisfying. I was at this Minami too. I thought your costume was immense! if you dont mind me asking, where did you get all of your supplies from? As i live near southampton, but i have no idea where i could get the things i need from. most of my fur and foam comes from a shop in north wales called "Abakhan", though you can get good furs from online sources such as [link] or fabricland (though make sure you get the good stuff, if fur is under £10 a metre it's invariably not good quality). Foam comes from Abakhan again as well as [link] and glues etc. can be found in DIY and craft shops.